Most recently, our project member Philipp Harfst has published and an article analyzing the political consequences of changes in district magnintude. In this blogpost he presents his intersting findings. Electoral researchers agree that there is a close link between electoral systems and party systems. The exact nature of this link, however, remains debated. In a recent article published in Acta Politica, I examine this relationship in more detail. In the article, I ask whether electoral system changes have observable effects on relevant aspects of party system characteristics and analyse whether these effects can be explained by the theories on the political consequences of electoral rules. In order to answer these questions, I look at the impact of changes in district magnitude on the size and disproportionality of party systems in young Central and Eastern European democracies. I take advantage of the relative frequency of electoral reforms in Central and Eastern European democracies and the fact that temporal orderings help us to confidently infer from electoral rules to party systems. Therefore, focussing on changes in electoral rules enables us to establish a dynamic perspective and to address the impact of electoral rule changes on mechanical and psychological effects simultaneously. I hypothesise that these impacts will vary over time. Since mechanical effects are simple mathematical transformations of votes into seats, they will set in immediately and wear off quickly. Voters will observe these mechanical effects and are able to strategically adapt to them after some elections. This process, conceived as learning, will take some time and, therefore, set in significantly later than the mechanical effect but last longer. In addition to this voter psychological effect, the article also specifies a party psychological effect: It is the result of party elites’ strategic adaptation to the anticipated mechanical and voter psychological effects. Since party elites’ knowledge about the effects of electoral systems should be enhanced than the one of voters, party psychological effects will unfold immediately and might, thereby, attenuate voter psychological effects. Like voter psychological effects, party psychological effects will last longer than mechanical effects: based on their real world experiences with the new electoral system, parties will continue to form, merge or dissolve strategically for several elections following electoral reform. Mechanical and psychological effects will translate in particular patterns of disproportionality. Mechanical effects result in immediate changes in disproportionality which are later on reversed by parties’ and voters’ strategic adaptation to electoral reform. Drawing on data on changes in district magnitude as well as electoral and legislative fragmentation and disproportionality, the empirical analyses suggest that mechanical effects of electoral system changes on legislative party systems materialise as hypothesised. 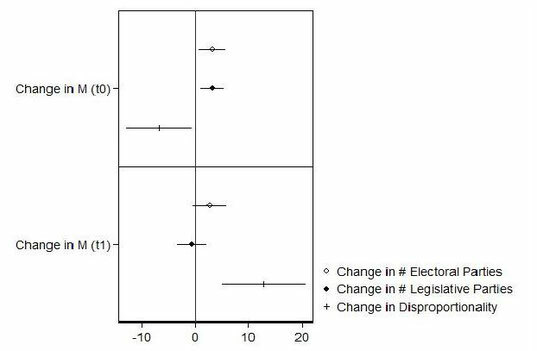 They have a strong impact on the number of legislative parties in the first election following electoral reform (t0) but quickly wear off in subsequent elections (t1, see full circles in Figure 1). Psychological effects are not as easily interpretable. The number of electoral parties also increases in the first election following reform (t0) and continues to do so in later elections (t1, see hollow circles in Figure 1), even though not in a statistically significant way. Additionally, psychological effects on the number of electoral parties at t0 and t1 cannot be significantly distinguished from each other. It, therefore, remains unclear whether we observe a party or a voter psychological effect and in how far we actually can discriminate between these two. Looking at the effect of electoral system change on disproportionality helps to partly resolve this puzzle (see ‘+’ in Figure 1). The analysis shows that electoral reforms’ effect on disproportionality sets in immediately at t0 and is more than compensated in subsequent elections at t1. This can be interpreted as evidence for the fact that immediate mechanical effects are more important than immediate psychological effects and that the latter only set in later. Supporting Taagepera and Shugart’s (1989: 123) “law on the conservation of disproportionality”, this finding also points to the conclusion that voter psychological effects and time consuming learning processes seem to play a more important role in the development of party systems than immediate strategic coordination among party elites. This would also indicate that endogeneity is not much of a problem in research on electoral reform: if those consequences of electoral reform that are based on party elites’ and voters’ behaviour materialise only after several elections, it is unlikely that anticipation of these effects have led short-sighted political actors to the implementation of electoral reform.